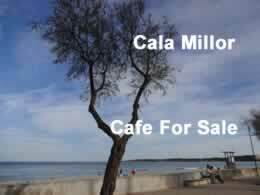 This is an ideal opportunity to lease a beautifully presented cafe situated just off the main street in the centre of the busy and incredibly popular resort of Cala Millor. The cafe has been owned by the same family for the last 10 years and currently trades for approx. 8 months per year although the central location situation, attracting both the tourist and resident trade, makes all year round opening possible. This well established cafe is situated 60 meters from the beach and has a large canopied terrace at the front seating 20 people comfortably. There is also a large canopied side terrace for the children, inc. TV, football table, various toys and 4 sets of tables and chairs. The spacious inside area has room for 30 covers and also includes a pool table, toy/grab machine, 6 TVs, Surround sound music system, Sky TV, Karaoke machine, 2 DVD players, X box, PS2. All fixtures and fittings are included in the price. To the rear of the bar is a fully fitted kitchen, inc. – 6 grill/microwaves, plancha, 5 ring hob and oven, 3 freezers, 2 industrial fridges, dishwasher, Air con. Ladies and Gents toilets are also at the rear of the bar. At night the front outside terrace has subdued lighting with 4 lanterns and twinkle lights surrounding a large authentic beach brolly. All legal documents are up to date. Unfortunately the bar is for sale owing to ill health.